This morning, it's pretty gloomy. I know the sun will break thru, soon, but I wanted to get my photo of the sycamores for this post. 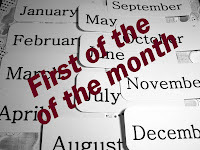 Hope you had a great month, can't wait to see your First of the Month photos. The old sycamore is grand against the winter sky, isn't it Jan? Thanks for keeping this meme going--it's going to be quite satisfying to have a photographic journal for the year of one subject. Cant wait to see this same tree next month. Hey, Jan. I actually made it on time this month to join in! I have decided to photograph a tree too...and, believe it or not, it actually DOES look a little different from January to February because the light is not the same. :) Snow in both photos, though! I can see the promise of a beautiful day in the sky! I can see each month the sycamore getting more beautiful. It is pretty amazing when you look back just a month. I hope the ground hog does okay tomorrow and doesn't see his shadow (or smell any females in the area) I am ready for spring...we have a wedding rehearsal dinner to get the backyard ready for. The sycamores seem so lonely with those pale skies behind them! Lovely photo! Beautiful tree. I'm afraid it would be white now if it was here. I tried to put in my link but Mr. Linky wouldn't load. So here is my link to my First of the Month. Have a great day! Me again. Mr. Linky finally worked. I got my link in. Have a great day! That's beautiful tree, and great photo! We have several Sycamore trees along the creek behind our home, and I really love their bark. I'm late! But I finally got myself posted for my first of month for February. You know I sort of wish I'd chosen a subject that was sitting still -- like a tree or landscape. But I do enjoy snapping my grands when they are absorbed in something.